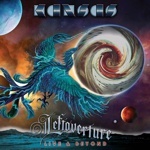 'Leftoverture Live & Beyond,' produced by Jeff Glixman, features nineteen songs selected from twelve shows recorded during KANSAS's Spring 2017 Leftoverture 40th Anniversary Tour. The set list includes classic hits, deep cuts, new songs from 2016's studio album 'The Prelude Implicit,' and culminates with the band's sextuple-platinum breakthrough album, 'Leftoverture,' performed in its entirety. Coinciding with the 40th Anniversary of 'Leftoverture,' and the release of 'The Prelude Implicit,' KANSAS embarked on their biggest headlining tour in decades. The overwhelming success of that tour led the band, along with Inside Out Music, to release selected songs from the tour as a live album. 'Leftoverture Live & Beyond,' will be released on November 3, 2017, on Inside Out Music. The album will be available as a double CD digipak, four 180 Gram Vinyl boxed set, and as a digital album.